Why release one barrel aged beer when you can release five at the same time? 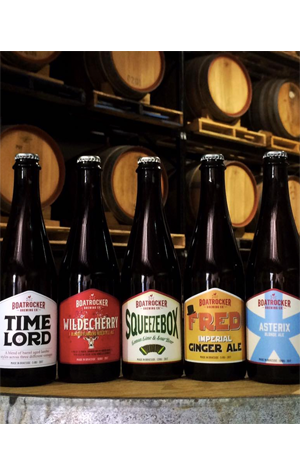 Given they've got more barrels filled with liquid to play with than any other brewery in Australia, it's a luxury Boatrocker can take – so it has, with all five featuring some quite lovely new look labels. As for the beers themselves, there's Squeezebox, a barrel aged saison that spent up to 12 months in French oak barriques with the addition of Brettanomyces and pediococcus cultures to develop funk and acidity. The barrel character is prominent on the nose, contributing an oaked Chardonnay like aroma, with the lemon and lime that reminded the brewers of lemon, lime and bitters more apparent to taste. Asterisk, probably our pick of the five, is described as a "session barrel aged blonde" – not a term you'd have expected to see bandied around a few years back. Once again, there's some Brettanomyces at play, delivering perfumey farmhouse funk. There's bready malts, a touch of oak and some balancing lemon zest like citric acidity. They reckon it's perfect for pairing with naked oysters from their mates at Pambula Oyster Co – or as a base for moules marinière. Then you've got Wildecherry, a blend of 12, 18 and 24 month Flanders red style ales barrel fermented with multiple Brettanomyces strains then racked onto fresh Morello cherries from the Yarra Valley before undergoing a secondary ferment for two months. You'll pick up sweet, Country Wives Association jammy fruit alongside the balsamic like acetic acid characters familiar to the Flanders red style and a touch of cleansing lactic acidity. Things start to get a little more challenging with the last two. Timelord is a blend of one, two and three-year-old lambic style ales, the first time Boatrocker has been able to offer up such a beer. All were barrel fermented with Brettanomyces strains and pediococcus and aged in French oak barriques, with the result a beer that's sweet, tart, sour and distinctly funky. One for the more experienced and passionate sour beer lovers. As for Fred, it's probably the beer best described as an "experience" out of all the beers released by Boatrocker over the years. Described by one person we shared it with as "Matso's on crack" in reference to the Broome brewing company's ginger beer, it's an imperial ginger beer that was brewed to infuse ginger flavour into Starward Whisky casks for its Ginger Beer Cask Finished Whisky. The brewers used 20kg of fresh ginger pulp, fresh orange peel, lemongrass and a few other herbs and spices and ended up with a beer nudging 14 percent ABV. They recommend trying it as a Starward boilermaker or as a julep with some ice cubes and mint leaves.